Notes: Retracing the path configured in the 'voicing mysteries' Newling will construct a white linen clad continuous table that will form the physical structure for the Preston Market Mysteries Meal. The table itself materially reconfigures or alludes to the prior use of the market furniture in the Insurance Stall event. Through the analysis of the 280 mysteries, evident as 'propositions' on www.lossofmystery.com, specific contacts will be made with individuals whose mystery seems to stand out as particularly incomprehensible to reason and self evidently intriguing. These individuals will be invited to the meal. Prior to this invitation the group will have been involved in a correspondence about the particularities of their mystery. It is estimated that approximately 30-40 people will attend this event. The meal will be publicly viewable from a roped space that will act as a boundary to the event. The meal will be both elegant and visually beautiful starting in the early evening. The table dressing, food preparation and cooking will happen in public view, within the boundary of the event. 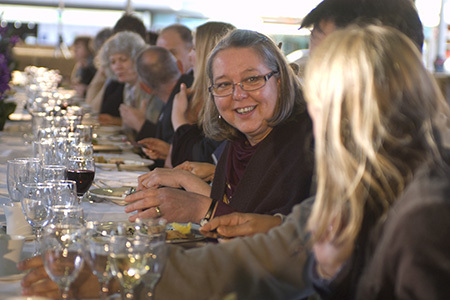 Whilst the meal is seen as a celebration of the market place and the project participants it is also viewed as a related but autonomous event. 'The Meal' seeks to engage in conversations that view new knowledge through the prior events. In this manner it is 'Knowledge' gained as a post liminal event.